There are many types of batteries available in the market. And two types commonly used for inverter purposes are lead acid battery and concealed battery. Both are tubular type but for long life applications lead acid batteries are more suitable. 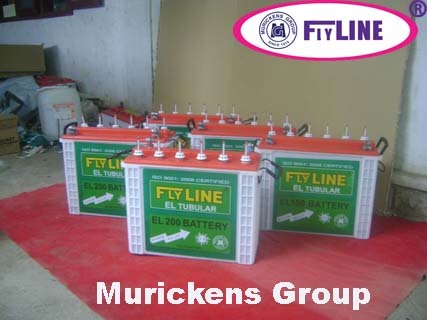 Murickens has developed two types of lead acid batteries, Heat sealed tubular batteries and Heat sealed INVA tubular batteries both in C 20 series. Heat sealed INVA tubular batteries are made with extra cabin capacity for the carriage of more acid that acts as a coolant and it gives more back up time than heat sealed tubular standard battery. For solar inverter applications the most suitable type would be lead acid INVA tubular heat sealed batteries in C 10 series. They are more efficient to complete the charging discharging cycle common in solar systems. Our batteries have international quality with ISO standard certification. 120 AH 20" 8" 18.5" 28,3 64.3 24.6 450 12 V (1.220 Sp.